#Pregunta: ¿Hay alguna manera de compartir de #PumpIo a #Diaspora / #GNUsocial, o viceversa? Servicios como pump2status.net permiten que tus publicaciones en Pump se publiquen tambien en tu cuenta GNU Social. Clientes como Choqok o AndStatus permiten tambien publicar (y leer) en ambas redes (y otras) a la vez. Genial, gracias a ambos, ! #RichardStallman talking about #freedom, #privacy, #security and #solidarity (in front of proprietary software, #oppression and #surveillance): He almost makes me cry! Javier Sancho, Cédric Heintz, Dennis Zeit, Michael (majeSTYX) and 1 others likes this. Vladimir, Javier Sancho, Cédric Heintz, Michael (majeSTYX) and 2 others shared this. An excellent 2012 interview to Eben Moglen (President of Software Freedom Law Center), talking about #FreedomBox, #Surveillance, #Facebook, #Google, #Liberties, #Rights, #Privacy, #Anonymous, #Wikileaks, #Technology, #FreeSoftware, #Copyright, #CopyLeft, #CreativeCommons, well, an awesome interview! «[...] Para tener un idea, por cada equipo que compra el estado provincial, el equivalente se paga por la licencia del software privativo. Es decir que por cada computadora se pueden adquirir dos si se utiliza software libre. Además los software que no se consigan se pueden desarrollar en la región. [...] “El software libre avanzó mucho en estos últimos años y la migración es bastante sencilla. En la región, el Concejo Deliberante de Paraná usa software libre y Santa Fe está teniendo una muy buena experiencia con la ley al igual que la Municipalidad de Rosario. En este tiempo se creció mucho en la Interfaz y en las cuestiones de ser más viable para el usuario”, explicó Mengarelli sobre algunas de las cuestiones más importantes. Latinoamérica, los países, están migrando y desarrollando en software libre. Entre ellos Ecuador, Bolivia, Brasil y Uruguay. Luego de que el exempleado de la CIA Edward Snowden revelara que Windows tiene “puertas traseras” que favorecen al espionaje informático mundial, los gobiernos se resguardan utilizando software libre. [...] “Software libre es el software que respeta la libertad de los usuarios y la comunidad. En grandes líneas, significa que los usuarios tienen la libertad para ejecutar, copiar, distribuir, estudiar, modificar y mejorar el software. Es decir, el software libre es una cuestión de libertad, no de precio. Con estas libertades, los usuarios controlan el programa y lo que hace”, explican en www.gnu.org. GNU MediaGoblin es un sistema libre y gratuito para publicar multimedia, como imágenes, video, y audio. Estamos creando un diseño para apoyar a la descentralización y mucha, mucha extensibilidad. Se le puede ver como un reemplazo federado para servicios como Flickr, YouTube o SoundCloud que tú o cualquiera puede usar y proveer. MediaGoblin está construyendo un futuro hermoso y responsable para publicar multimedia, ¡pero necesitamos tu ayuda! The goal is to cleanup and release the #sourcecode that was used to power Lavabit as a #freesoftware project with support for dark mail added. Lavabit's Dark Mail InitiativeThe goal is to cleanup and release the source code that was used to power Lavabit as a f/oss project with support for dark mail added. 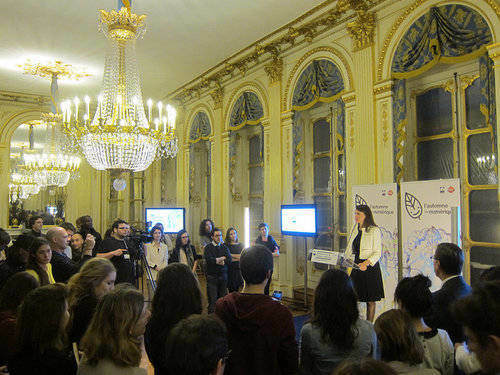 Aurélie Filippetti / Open Knowledge Foundation / CC BYFrench minister of culture and communications Aurélie Filippetti launched a set of initiatives yesterday designed to promote a more creative, more open France. The impressive announcement covers a lot of measures, including an open data policy for cultural data, the launch of a new workspace designed to stimulate cultural innovation, and much more. But of particular interest to us are the new partnerships Filipetti announced with the Open Knowledge Foundation and Creative Commons France.The ministry of culture and communication will work with CC France to educate students, cultural creators, and society in general on understanding and using Creative Commons licenses. According to the announcement, “These tools align with intellectual property law and fit perfectly within the minister’s policy of digital inclusion as a part of her great national project for arts and cultural education.”*Meanwhile, the ministry will also work with the Open Knowledge Foundation France to map the French public domain, making it easier for anyone to discern whether a work is in the public domain or not. This partnership is the next step in OKFN’s Public Domain Calculators project, and it’s great news for anyone who cares about a vibrant, living public domain.We applaud Minister Fillipetti and congratulate both CC France and OKFN France on this exciting partnership. *Rough translation from the French announcement. The American people do not want the United States to go to war in Syria. There are no American interests being threatened in Syria. Syria has not attacked the United States, nor American citizens, nor has Syria attacked United States armed forces personnel. There has been no Congressional declaration of war. There has been no United Nations Security Council resolution authorizing the use of force in Syria. To go to war in Syria at this time would be illegal and unconstitutional. To go to war in Syria at this time would be criminal under international law, the crime of aggression. The President of the United States is not authorized under law to declare war on his own. If the President will decide to go to war without a declaration of war from Congress, that would be an impeachable offense. #Divest from @Netflix: show them they can't force Digital Restrictions Management on the Web. RiveraValdez favorited ¿Qué hay tras las fronteras? RiveraValdez favorited ¡Ay, qué miedo! RiveraValdez favorited Swift 4.0 Jabber/XMPP client is out! RiveraValdez favorited ¡Boicot a Amazon!